This TC was created during my first playthrough without knowing on any rules or briefings. These have the darkest days of my life. Aurora went down as we approached 4546B in a series of explosions and flames. It was only through pure luck that I survived and fell into this mass ocean. Little did I know of the many dangers that lie within. As if the fallout of the reactor explosions were not bad enough, every distress call I explored resulted in only more questions and pure loneliness. I believe I have found a way to leave this place. In the event that someone is left on this planet. I leave you with what I can to increase your chances of survival and my one photo that displays a single pocket of beauty and hope in this vast ocean of darkness. Now that the last two achievements have been fixed, I launched again to get 100%. Below are the contents of my second time capsule. Everybody can always use more copper, right? What's with all the OP ones? Sorry, but I feel they make the game too easy. So many ion batteries, it's so cheaty. 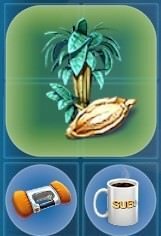 Curious: are the capsules moderated in any way right now? Because I've seen people on Reddit claim they got end-game items in them at the very start of the game and it just feels... wrong. Not to mention that some of the images I've seen should have never made it, either. I doubt it, I've found Ion Batteries and Ion Power Cells in them, as well as Ion Crystals. P.S. 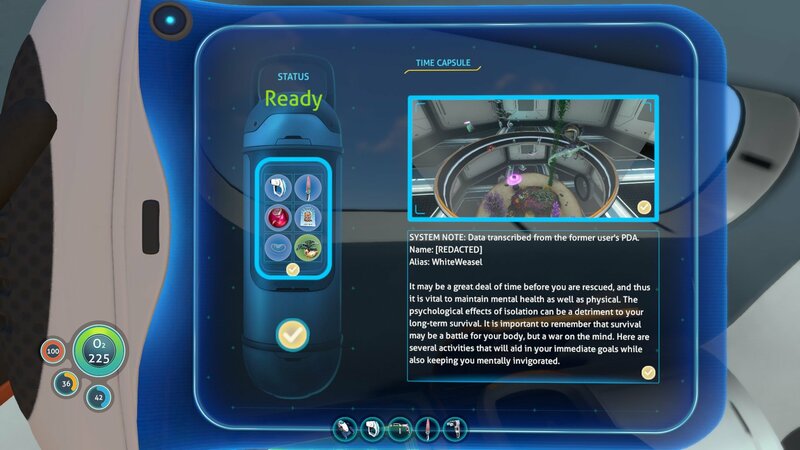 : Somehow I got the time capsule achievement without sending a time capsule, has that been fixed? I've sent one since but hadn't prepared one the first time I launched the rocket. 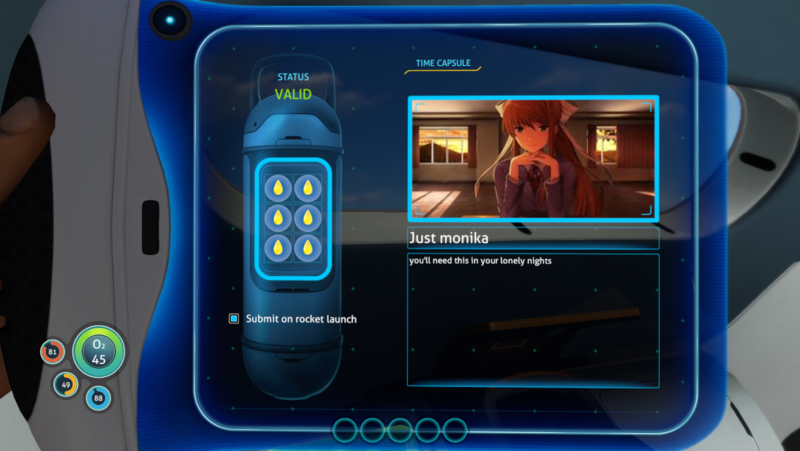 I'm nearing the end of the game, and I was debating on how to fill out my time capsule. I was thinking about putting some good gear in there like a stasis rifle and an Ion powercell, but that seems like what everyone else is doing, so that's kinda boring. 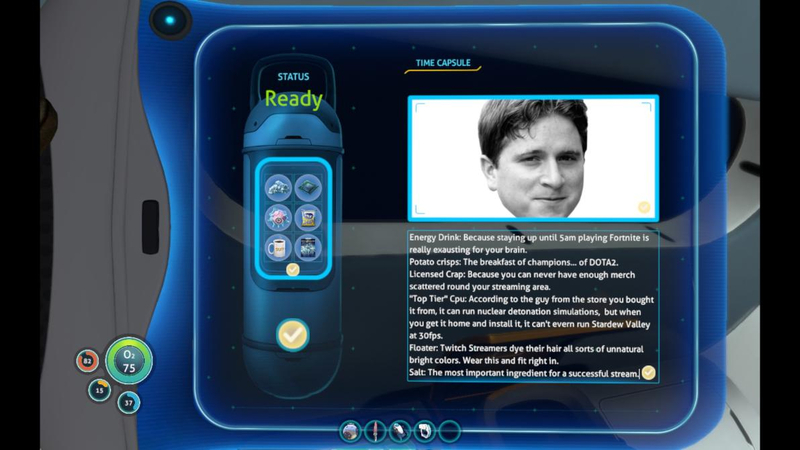 I decided to do a more flavor-driven time capsule. The items are still in flux. 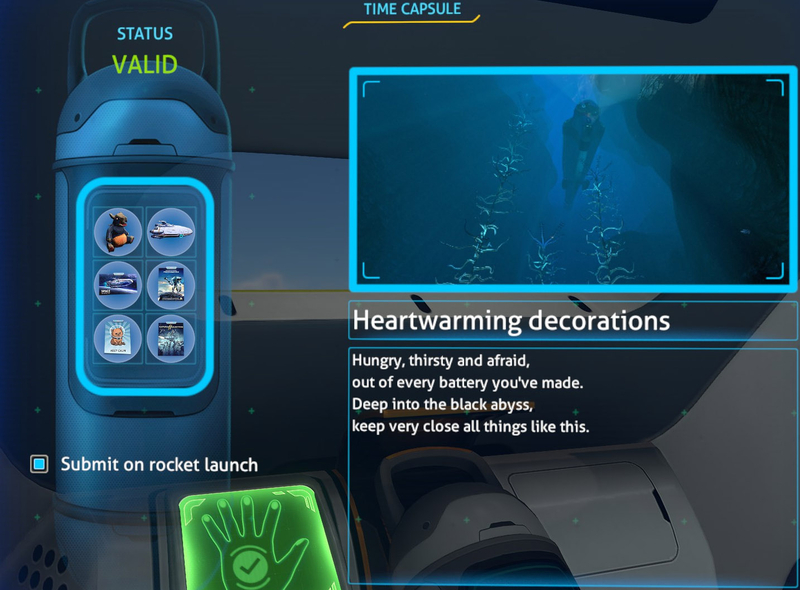 I might remove the knife to put another scanner room upgrade in there, and change the crashfish egg to something else, but so far everything else keeps with the theme of the capsule. Any thoughts before I send it off when I beat the game in the next couple of days? SYSTEM NOTE: Data transcribed from the former user's PDA. It may be a great deal of time before you are rescued, and thus it is vital to maintain mental health as well as physical. The psychological effects of isolation can be a detriment to your long-term survival. It is important to remember that survival may be a battle for your body, but a war on the mind. Here are several activities that will aid in your immediate goals while also keeping you mentally invigorated. -Catalog everything, remember that you have no shortage of time, no subject material is above interpretation. -Keep a photo journal to document locations for navigation and to establish positive memories with the more visually striking venues. -Start a garden, maintaining crops is an excellent passtime. -Keep an aquarium, live specimens and their behaviors have countless ways of keeping you mentally stimulated. -Investigate visited locations for new discoveries. 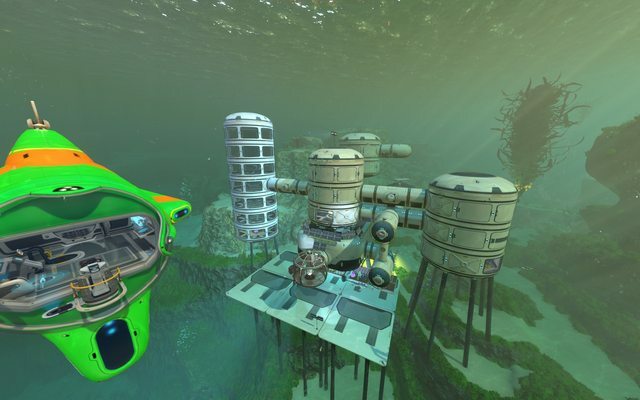 I'm thinking about making a time capsule with Hatching Enzymes, Cyclops Shield Generator Module, Prawn Suit Depth Module mkII, Prawn Suit Grappling/Drill arms and a Prawn Suit Thermal Reactor module. I actually kinda like this one. It's simple, some easy to get stuff (Aside from the Thermoblade and Sonar Upgrade) and works well for new players. Good job! 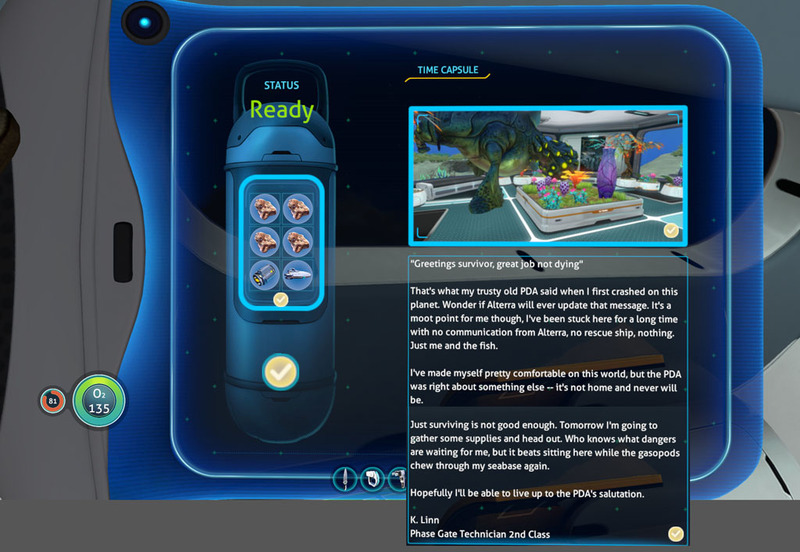 While I can't speak for all capsules out there, the PDA blurb: "Alterra requests time capsules be stocked with tools and resources which will aid those who may discover them in the future." is at least partially to blame for that, as it encourages putting "useful" stuff in it. It's not much of a stretch think a first time/naive player would to take that to heart and put the most "useful" stuff they can think of in there, which is often late game equipment and/or rare resources. Thanks. I feel the scanner room upgrade is the right balance of something that's useful without being too much, and it's something that a player doesn't need to be very far into the game to get mileage out of it. Unlike that single chunk of kyanite I got from a time capsule, where it was an item so late game I could not use it until I could obtain it regularly anyways. You have found my time capsule which means that I'm either dead or have made it off of this planet. If you find yourself in the dire circumstances that I once was in then know there is hope. I leave you with three items that saved my life. Air bladder - The amount of times this saved my life I cannot begin to count. When your oxygen is running out deploy this item and even if you start blacking out stay true and hope. Coffee americano - It may not provide much drinkable water but if you happen upon the blueprints for a coffee machine it may very well save your life. A tip, you can brew two coffees at once. In the meantime savour this brew and feel refreshed with the taste of home and hope that it brings. Bulbo tree sample - A game changer for me. The bulbo tree does not provide sustenance for long trips but it does provide a renewable source of food and water for when you are at home base building. Let this seed fill your base with life & hope. 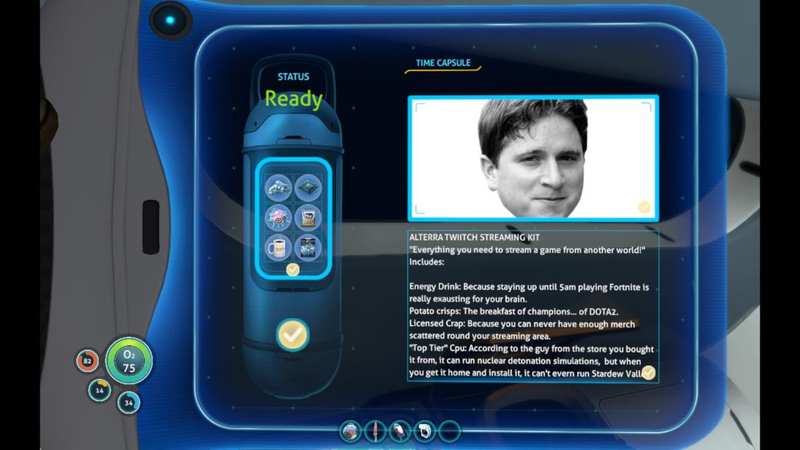 "Hi survivor, I'm Cave Johnson. It may have already occurred to you that you're currently stranded on a desolate puddle in the middle of one of the least frequented trade routes in the galaxy. And if you haven't, then... you're doin' fine, soldier. This may sound bad now, but wait 'till you hear this next bit and then you'll feel a good deal more proud of your survivability thus far. You see, it turns out that if you splice the genes of the common cold virus with a Tardigrade in sufficient quantities, and then feed the result ionized citric in its supersolid state (and then give it the taste of the human genome), you've got yourself a bloodthirsty hive-mind race of xenomorphs which can travel through space and attack any organism's DNA directly. Still following me? Good. I suppose you know what I'm about to say from context, but I think I'll just go ahead and say it anyways. The planet you're currently inhabiting happens to be infested with the epidemic and you might be suffering from it yourself. But don't panic! The plague began on the other side of the planet and you're currently staked out in the safest place a creature could be around the globe; so there's a chance that you're not yet infected. Us scientists are currently doing as much as we can to neutralize the infection right now; which means that we will have a cure ready for you as soon as we figure out exactly what form the mutated xenomorphs have taken. So far, we've tried conventional antibiotics, lemons, Mesmerism, homeopathic placebo, lettuce extract, high fructose tomato extract, argolian sun tiger extracts, yelling therapy, the works; and so far, we've figured out the included base for a potential cure. We don't know how to make the base a xenomorph yet, but just hold in there. For now, just follow the following instructions on application. Johnson out. 5. if you already show signs of infections, apply to rash"
I beat the game and sent my capsule on it's merry way. Sadly I don't think it's ever going to be seen by the devs. The way voting works seems only show the oldest first. Sorry to bump this, but I HAD to post my new capsule. 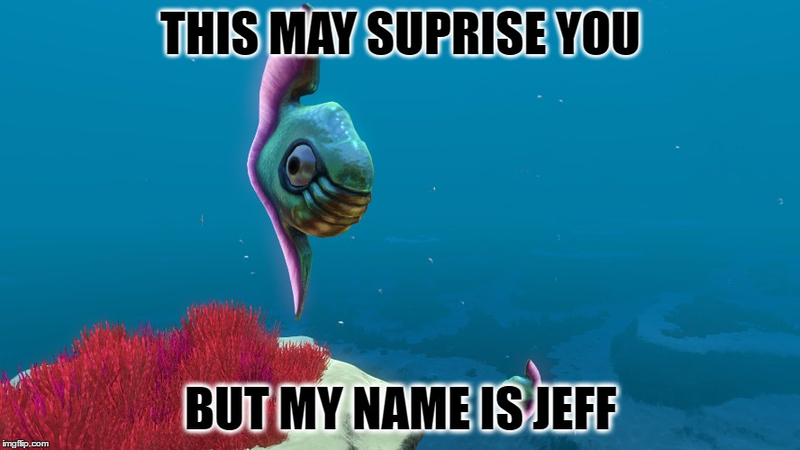 Can an already hatched cuddlefish be added? And what items cannot be added? 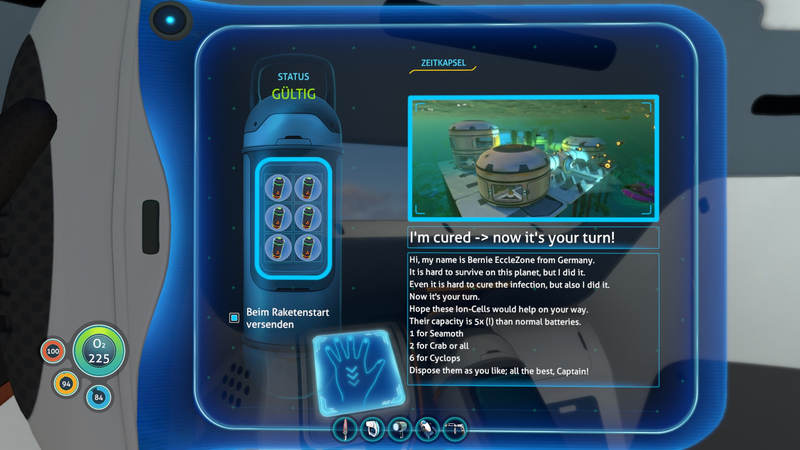 In my opinion a hatched cuddlefish would be very nice for players who dont have the big aquarium yet, also an ion powercell for the seamoth or a jet for the prawnsuit. But limbs grow back now right? Contained a stasis rifle with a completely drained battery.